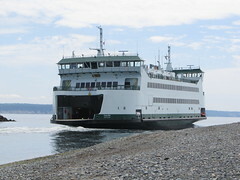 You're invited to a community celebration to welcome the Salish from 11 a.m.-1 p.m. Thursday, June 30, at the Port Townsend ferry terminal. Details forthcoming. I also plan on attending. I would like to go but I am working. 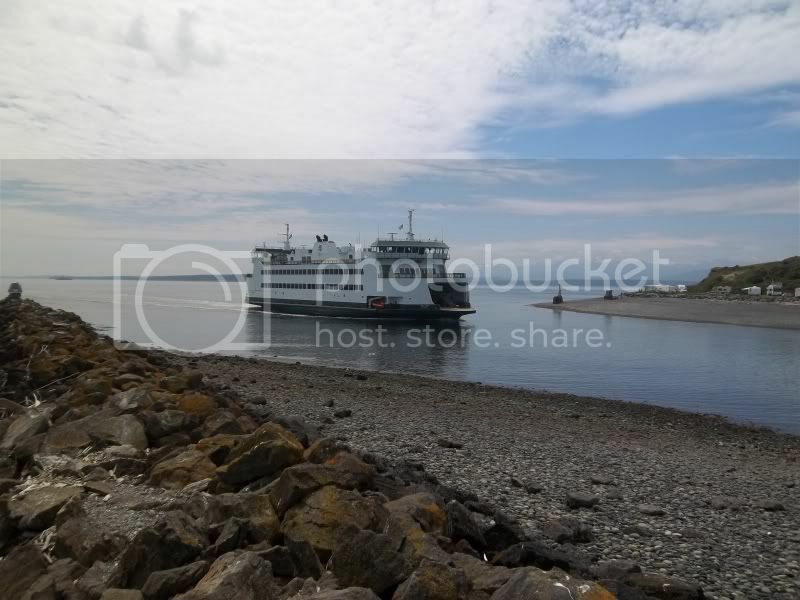 I might plan on doing a trip down to Port Townsend sometime this summer if I can afford it to ride the Chetzy and the Salish all in one trip. I might go. I went to the Chetzemoka Open House, so I'm not all that excited about this one. I may just end up waiting until she is in service, then go for a ride and take pictures then. I'm off that day, so I'm definitely planning on going. I missed the Puyallup open house as well as the Chetz. I didn't do the Puyallup open house either, but I did do Tacoma's open house. That one was really cool because that's back when they were still letting folks go down into the engine room and all those compartments below decks. They did not do that at the Chetzemoka open house. I wish they still would do that. I had a rare treat of being able to go into the wheelhouse at No. 1 End of the Chelan a long time ago on the Seattle/Bremerton run as a kid. I miss those days. Took a trip to Port Townsend today to see the SALISH and to attend the Seattle Symphony concert at Fort Warden. MV SALISH in Keystone Harbor during one of her many practice landings at this dock. 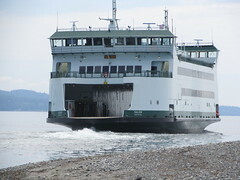 SALISH enters for another landing. The SALISH heads out for another aim. 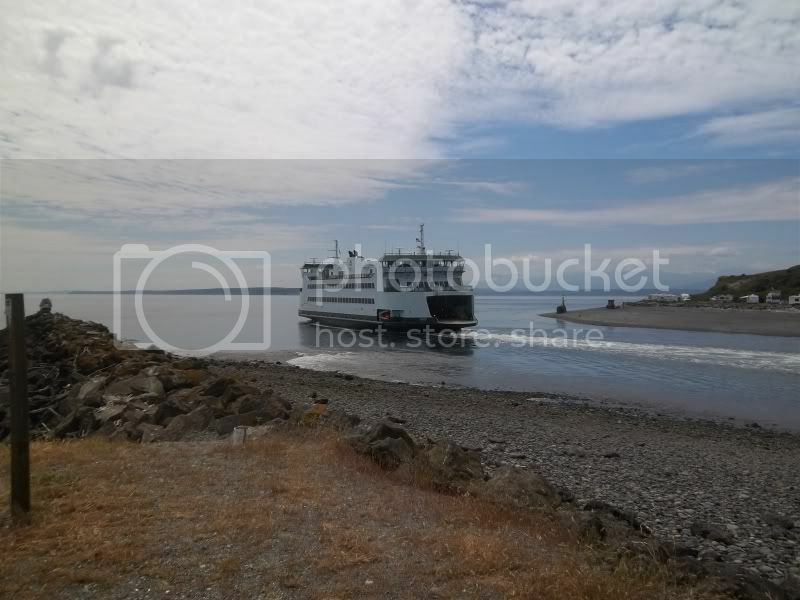 After witnessing one more landing, we see the SALISH head for Port Townsend as the CHETZEMOKA enters Keystone Harbor. Time for me to get my ticket! 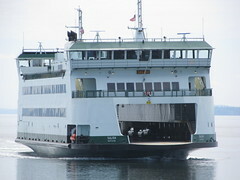 Arriving Port Townsend with the SALISH in the dock. SALISH from aboard the CHETZEMOKA. SEEING DOUBLE! 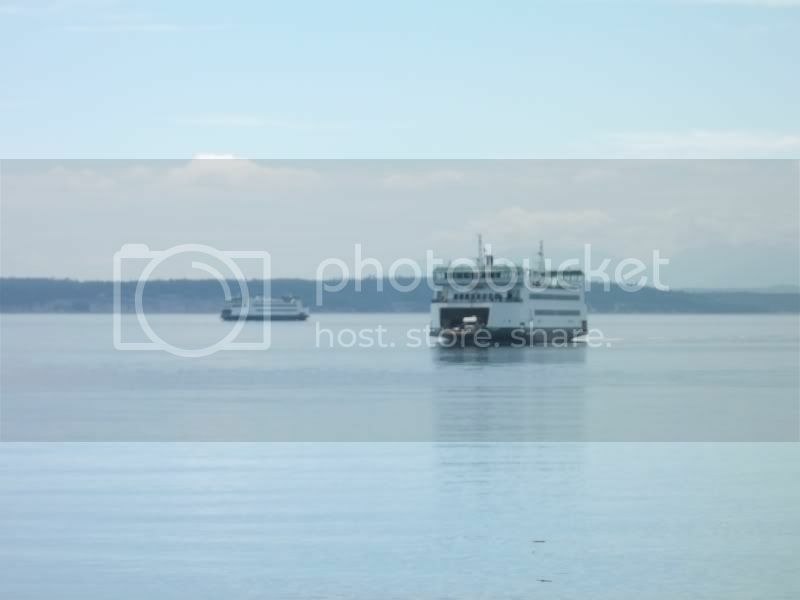 My last visit here in Port Townsend saw the CHETZEMOKA and STEILACOOM II together. The ST2 was getting ready to leave for a harbor hospital to get renewed for her return to Pierce County. That was in November 2010. Today, we see the CHETZEMOKA and SALISH together. The CHETZEMOKA sails on another trip to Keystone Harbor. The SALISH takes a break from crew training sessions. My observations of the SALISH's landings and departures in Keystone Harbor reveal that she is ready for service, pretty much so, to say the least. She sounds a bit different than the CHETZEMOKA due to the difference in propulsion drives. wow that second photo you posted from the top sure shows how low the tide is there. Could almost walk right out to the ship, lol! I hope to ride these boats sometime this summer if I can afford to go down there. 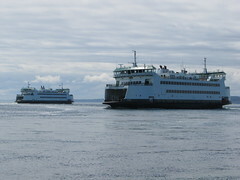 Might make a nice day trip on the Coho and a few trips on these ferries except for the lack of parking in Port Townsend. It's funny how I am more interested right now in WSF than BC Ferries but WSF trips for me are more hard to do from Victoria, lol! :)this is quite a splash of pics. 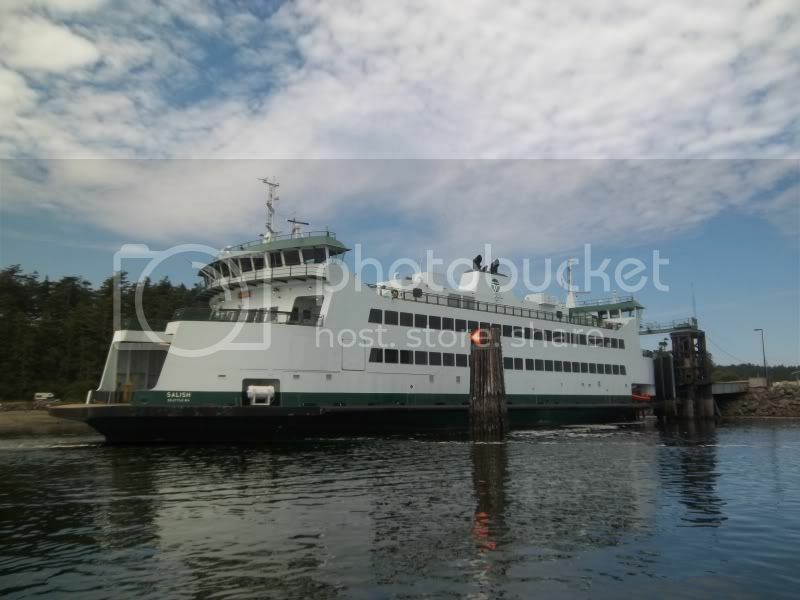 that EG has posted, and thanks for this, we really need to come to the end of hockey time and focus on this wonderful northwest ferry scene, which is much more uplifting! mrdot. 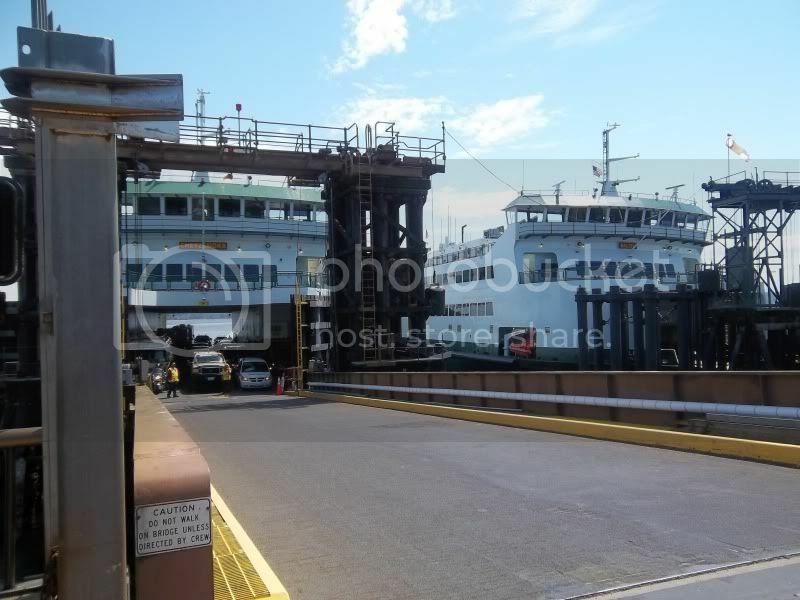 :)with all my wires crossed I will correct my last correspondence to credit ferry nut seattle for the wonderful submission of pics. and again try and change the channel on the hockey nutbars, that don't need any more noterity, just some hard time. :'(mrdot. Thank you for your complements. Yes, it was not the way the Canucks season should have ended. I had a sense that the fellas ran out of steam after those hard fought series of rounds during the playoffs. CBC set the final scenes in its farewell from hockey broadcasts of this season with a rather sublime overcast views of Vancouver Harbour. We may hear that great voice of Mr. John Ashbridge next season. This rink announcer said he would retire when the Canucks win the Cup. Hopefully next season. He also announces to the rink crowds at Pacific Coliseum during Vancouver Giants games in the WHL. The Seattle Symphony concert was great! It was held in the blimp hangar at Fort Warden. It was a full house!! 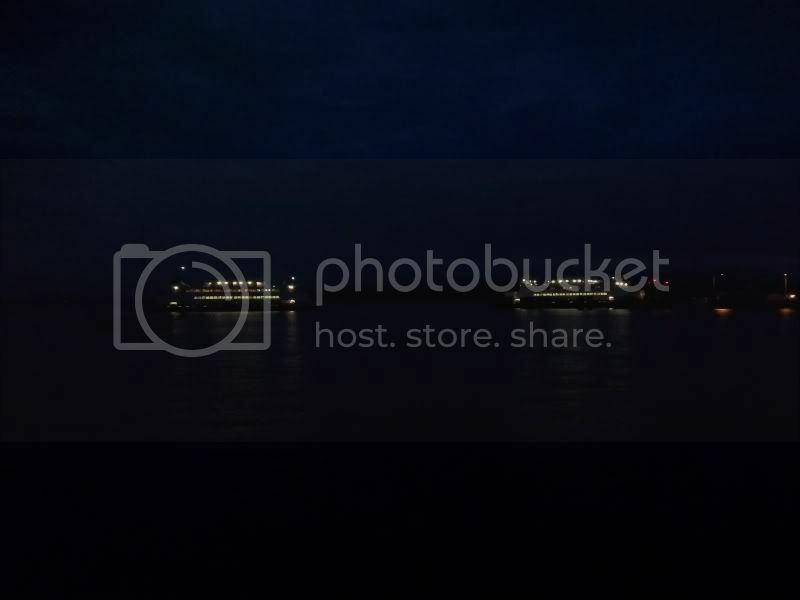 Following the concert, I went to the waterfront to capture night scenes of the ferries here in Port Townsend. The nightcap of a very fun day. The CHETZEMOKA arrives for the last time this evening with the SALISH in the second slip here in Port Townsend. How did the Seattle Symphony come to do a concert in a blimp hangar? I would have thought Port Townsend would have some sort of beautifully restored old concert hall, given the heritage of that town. Spent a very pleasurable morning there back in April, wandering around photographing old buildings and homes. First visited there thirty some years ago, but my only memory of that was being reluctant to drive off the ferry (perhaps the Rhododendron or Olympic?) given how the boat was bucking around in the slip on a very blustery day. 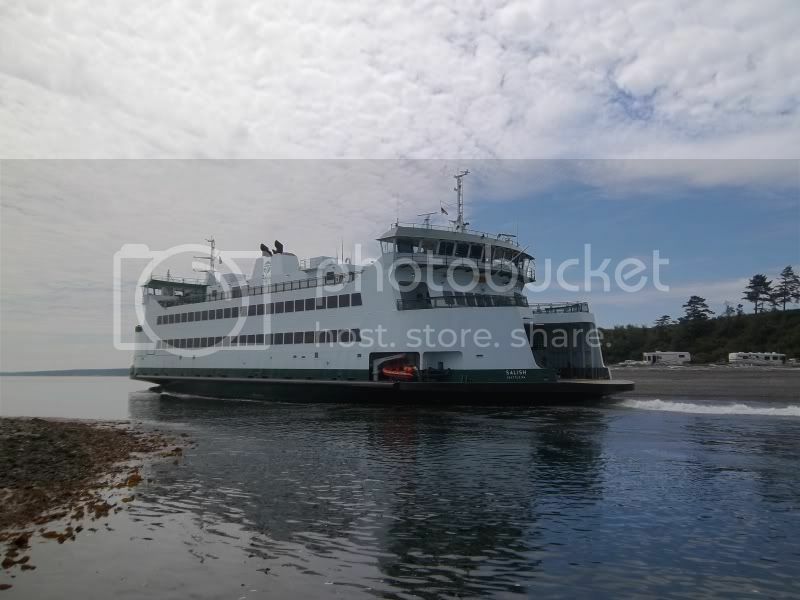 Hopefully, if Port Townsend's economy has been hurt by the loss of regular seasonal ferry service, it will pick up with Chetzemoka and Salish both on the route. Ha...I think that I am being followed. I was at Coupville when they were doing some landings at low tide time and was getting photos from the other side of the harbor. She sure launched out of there in a hurry. Quite the rumbling from her engines as she departed. I was also on the Chetzemoka when the photo of her arriving Pt. Townsend was taken. The people here in Port Townsend turned this hangar into a concert hall. They call it the McCurdy Pavilion. Much work was done with the usual elevated seating as you go up from the stage. Permanent seats with portable ones. A pre concert photo of the fully assembled stage. The stage can be configured to any size that's required for certain concerts. Centrum is the promoter. The Seattle Symphony rode in two chartered coaches from Benaroya Hall in Seattle. 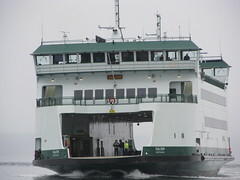 They used the Bainbridge ferries both ways. 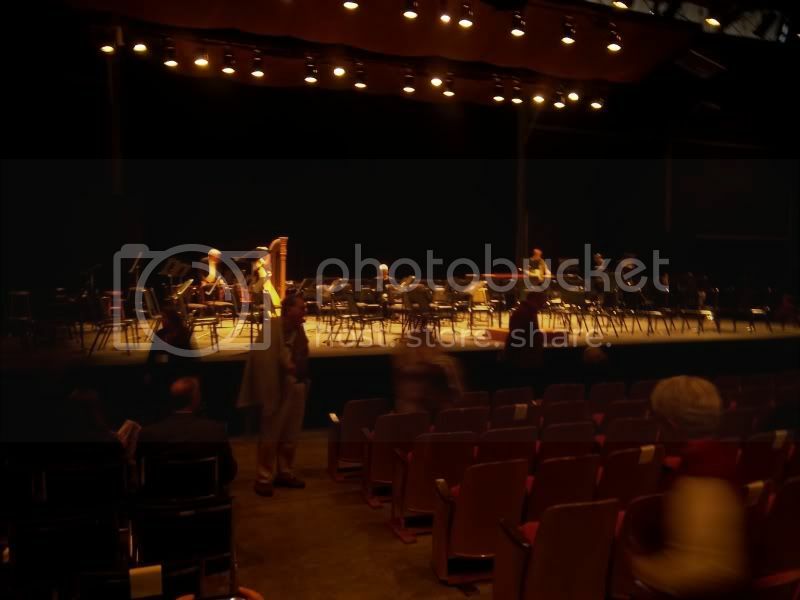 They now set up for the next concert at the Ben set for Saturday night with a work by Mahler with orchestra, chorus, and the concert pipe organ. This is the "Resurrection" Symphony. More photos of the SALISH will be taken soon and will be forthcoming on this thread. :)I went to Victoria High with John Ashbridge, and with my son went to many Giants games. It is my hope to see a cup soon for the both of us! The new WSF looks pritty good to me! Thanks for the good will and posts! :)mrdot. Maximum of 800 x 600 pixels on threads, 700 x 200 pixels for signatures. Oversized images make threads hard to read forcing viewers to constantly scroll to the right to finish each line. On this website, staff strictly enforce a limit of 800 x 600 pixels on threads and 700 x 200 pixels for signatures. 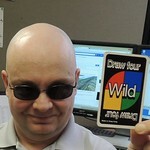 Any photo that is exceeding these dimensions will be removed. In order to share and post pictures to this website, you must sign up with a host such as Photobucket or Imageshack. Photobucket is best for those who do not have their own website. Photos posted to this website, unless otherwise noted, are the sole property of the copyright holder. Possessing any image that has been obtained without consent and / or credit to the copyright holder is illegal. So, the colors of the Salish are very comparable to the Chetzemoka. She The fake wood trim is lighter and the seats are much different, but the floor is the same green color. I was hoping to see a completely different color palate on the new boat. Something about the new props makes her much louder than the Chetz. The rub rails look much better though. 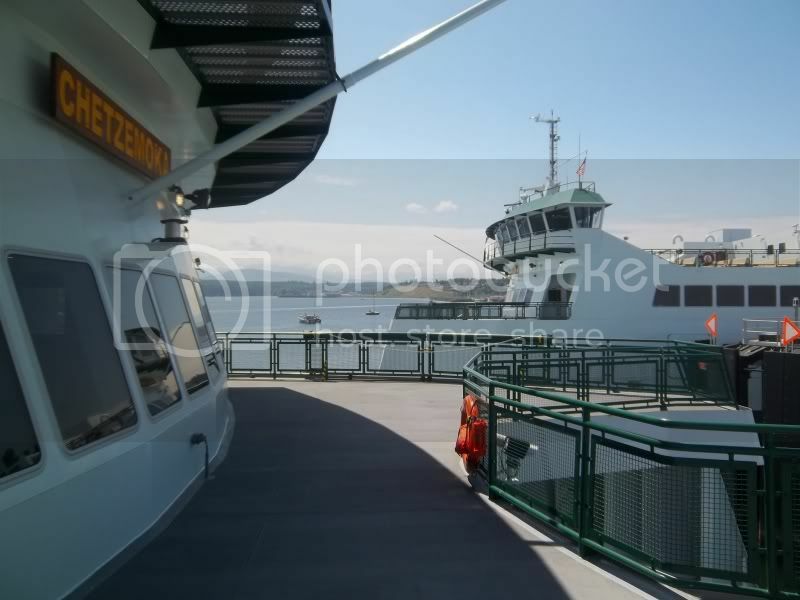 Another thing with the Salish is that the car deck clearance is 15' 10" while the Chetzemoka is 16'. The evacuation slide doors are build into the side of the vessel and do not stick out like the doors on the Chetzemoka. The exhaust stacks are a little shorter than the Chetz. ...I wonder if the elevator goes any faster. 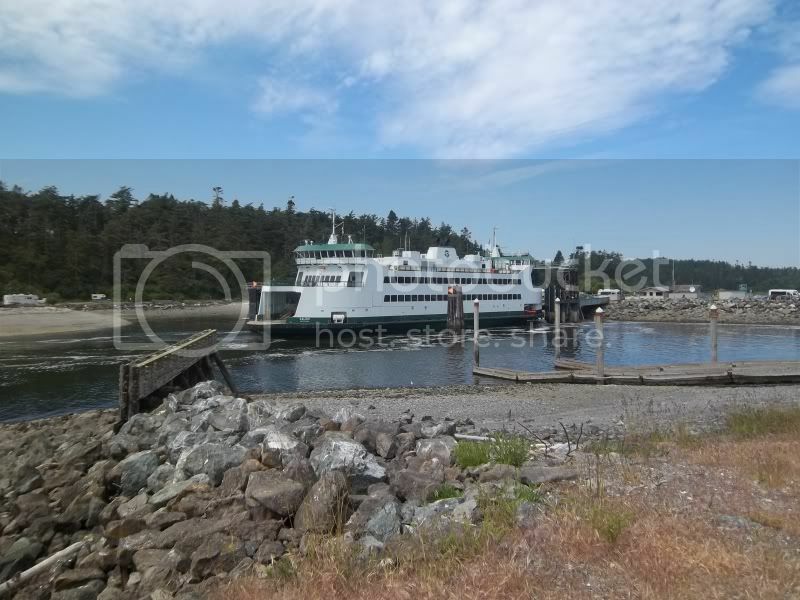 I am going to maybe plan a day trip on the Coho over to Port Angeles then drive to Port Townsend to do a few trips on the Chetzy and Salish. Maybe sometime in August. You should spend at least one or two nights there. Port Townsend is a neat place to be. Even in the night. It's rather fun to see the CHETZY arrive at the dock for the last time on her final trip of the night as you can see the navigation lights be turned off as well as the Saloon Deck lights and listen to the engines stop. Choose one of the older hotels to stay at. 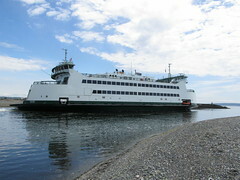 I'll be in Port Townsend this weekend to see the SALISH do more practice runs. 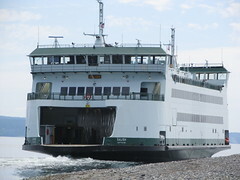 PORT TOWNSEND — Even with the inability to support itself, the state ferry system has made significant progress as evidenced by next week's inaugural sailing of the MV Salish, its top executive told county commissioners Monday. I would like to do at least an overnight trip but I am already going away in July for a few nights and week in September so if I can afford an overnight trip I might do it in August otherwise a day trip will be fine for now anyways. 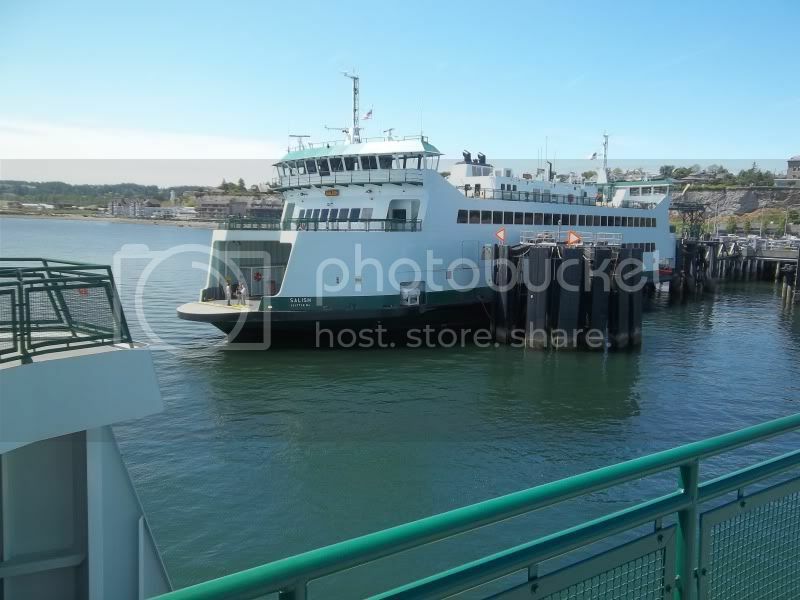 I also want to do the Evergreen State in the San Juans but I would do that if I did an overnight trip cause I can always go back to Port Townsend another time.